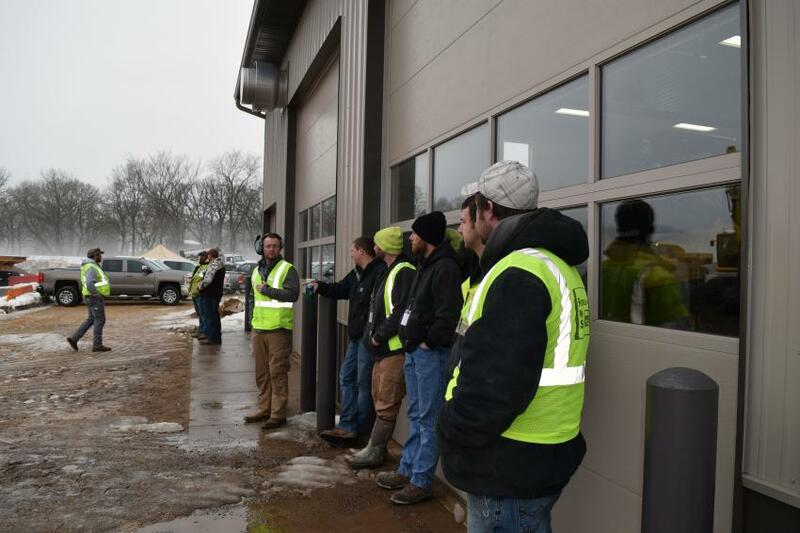 On March 14, Road Machinery & Supplies Co. hosted an iMC Demo Day at Extreme Sandbox in Hastings, Minn., with 62 customers from 26 companies attending. 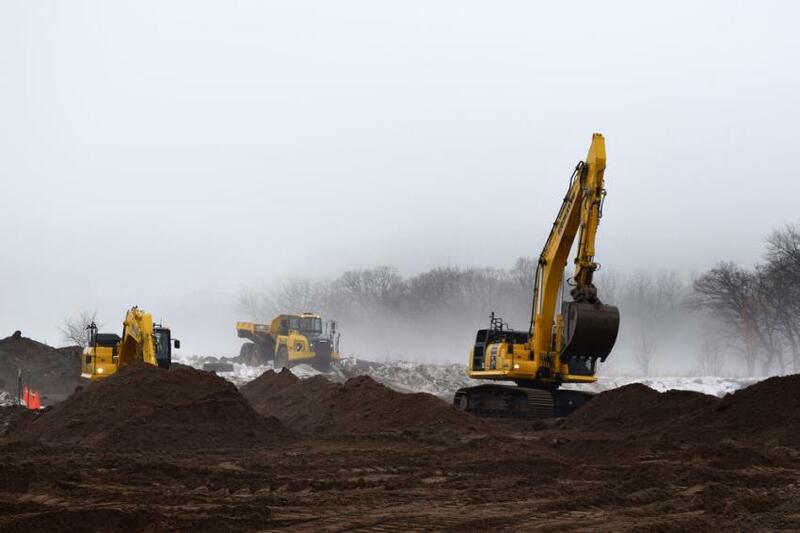 Komatsu iMC machines available for operation included the PC210LCi-11 and PC490LCi-11 hydraulic excavators and the D51PXi-24 and D65PXi-18 crawler dozers featuring Komatsu's GPS integrated machine control (iMC). Komatsu's iMC technology leads to significantly increased productivity in many applications over comparable size machines without iMC and machines with traditional GPS controls. In addition to the iMC machines, customers could operate a Komatsu HM300-5 articulated haul truck and WA480-8 wheel loader, a Morooka MST1500VDR rubber track carrier, and an AMS GT104 track screen. 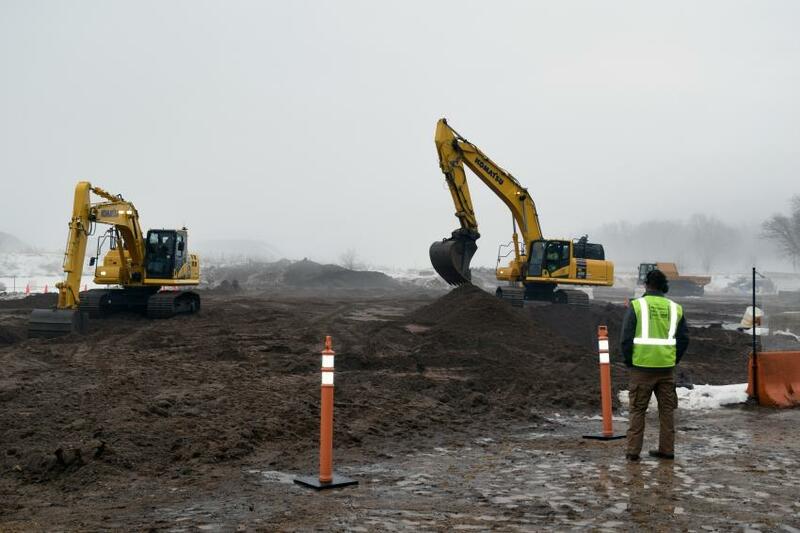 Road Machinery & Supplies Co. is a distributor of construction and mining equipment with sales and support operations throughout the Upper Midwest. It is a multiline dealer and backs up its preferred brands with a commitment to employee training and service excellence. 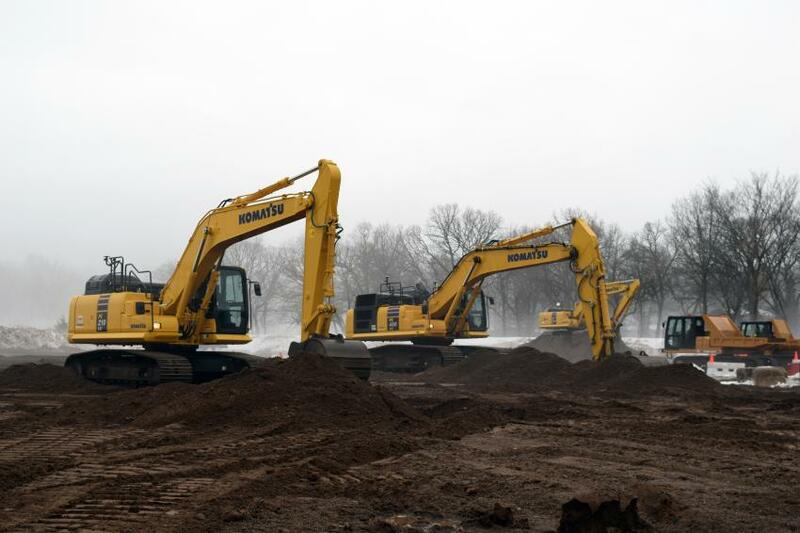 Machines available for operation included the Komatsu PC120LCi-11, PC490LCi-11 and HM300-5. 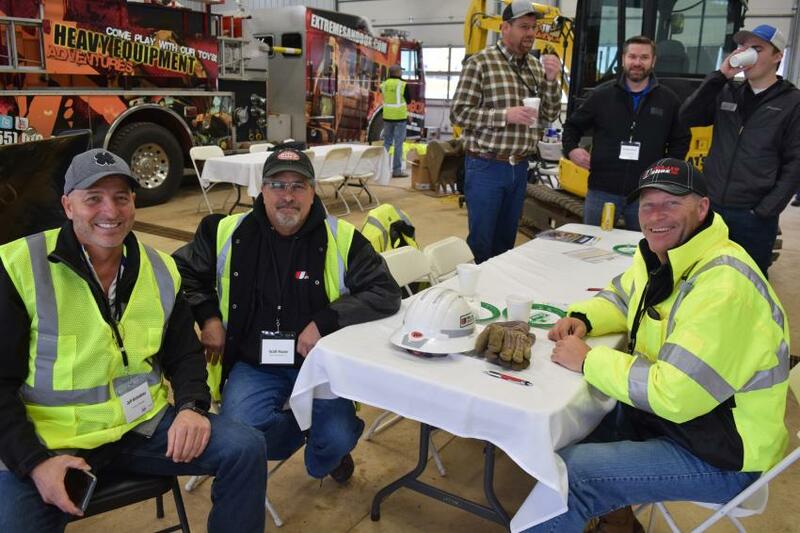 (L-R): Jeff Bistodeau, Road Machinery & Supplies Co.; Scott Rouse, Ulland Brothers Inc.; and Brad Jahnke, Ulland Brothers Inc.
Customers line up to operate the intelligent excavators. 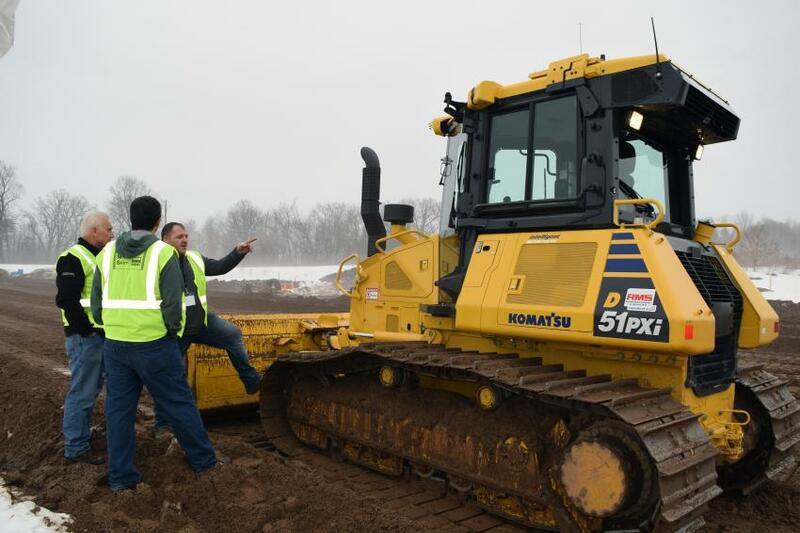 Phil Major of Road Machinery & Supplies Co. shows customers the Komatsu D51PXi-24 dozer. The Komatsu PC210LCi-11 and PC490LCi-11 and the Morooka MST1500VDR were among the machines available for operation. Brandon Rakers, Komatsu America product specialist, answers questions while customers operate the intelligent excavators. (L-R): Chris Peterson of C.J. Moyna with Brad Jahnke and Scott Rouse, both of Ulland Brothers, and their RMS territory manager, Jeff Bistodeau. “This is a great event — lots of equipment you can get in and test, see how it performs. We’ll be back again,” said Peterson. Randy Stenger (L), founder and CEO of Extreme Sandbox, speaks with Komatsu district manager Justin Sailer. EventsMinnesotaRoad Machinery & Supplies Co.
Events Minnesota Road Machinery & Supplies Co.